When you look at two very popular verses in the Bible through the lens of history, understanding their meaning has had great impact on modern Christianity. The verses, Ephesian 2:8-9, are a simple, but profound statement about the gift of God that He has given to humanity. However, there are some that suggest that what these two verses teach is justification for a theological system of interpretation that has historically and practically lead to tragic consequences. 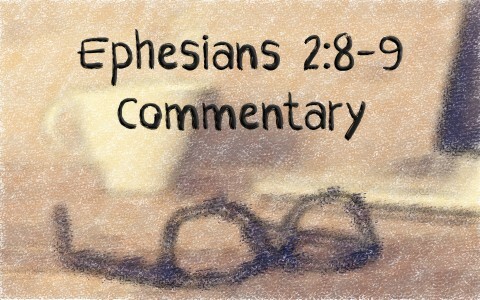 An examination and commentary of Ephesians 2:8-9 using the rule of Bible study makes clear what these two verses teach. What is the context of Ephesians 2:8-9? Examining each phrase in context reveals some amazing things about God and His love for us. Theologically speaking, In Ephesians 2:1-7 we learn that while we were yet sinners and dead in trespasses and sins, God loved us enough to quicken us, or give us life. Practically speaking, we lived our lives in the ways of the world, according to Satan and an unholy spirit of disobedience. We lived amongst a world that operates through the lusts of our flesh, fulfilling the desires of our flesh and minds as the natural children of anti-Christ destined to eternal wrath. However, God loved us so much that He extended mercy to us while we were yet sinners by mercifully giving us this new life through Jesus Christ. Like Christ, He has raised us up together so that one day we all would sit together in Heaven. This manifestation of God’s grace and mercy would be demonstrated to us in the ages to come by God’s kindness toward us through Jesus Christ. What does Ephesians 2:8-9 teach? There are three components to this phrase. If you have ever diagrammed sentences in school, you can see the relationships of these components. First, “By grace” is a prepositional phrase that refers to why we are saved. Second, “are ye saved” is a verb phrase that describes the verb “are saved”. The word “ye”, describes who are saved. Third, “through faith” describes how we are saved. Together the phrase, “For by grace are ye saved through faith” tells us that because of God’s grace (why) He saved us (who) through our faith (how). With this in mind, those of you who have diagrammed sentences can see that the subject of the first phrase or sentence is salvation. This is where many get confused and come up with alternative meanings of these verses, they wrongly define what is the gift of God. Therefore, we have to ask ourselves what is being described by the word “It?” Some would say grace. Others would say faith. The key is to ask what are these two components talking about? The answer again is saved or salvation. Remember, the first phrase is talking about why, who, and how God saved us. As we saw in the context of Ephesians 2:1-7, the topic of this passage is salvation. The substance of things hoped for (Hebrews 11:1) is the hope of salvation we have through faith in Jesus Christ, Who is defined as our hope (Colossians 1:27; 1 Timothy 1:1; Titus 2:13). This faith for salvation is an anchor for our soul (Hebrews 6:18-20). At the moment we are saved, God immediately gives us the Holy Spirit of promise as the earnest, or non-refundable guarantee of our inheritance, Who seals us until the day of redemption (Ephesians 1:9-14; Ephesians 4:30). The Holy Spirit then produces the evidence of things not seen, which is the fruit of the Spirit. Part of this fruit of the Spirit is faith (Galatians 5:22-23). Since the Ephesians 2:1-8 is talking about salvation, it cannot be talking about the faith as the fruit of the Spirit because we do not get the Spirit until immediately after God saves us. Therefore, the faith described in Ephesians 2:8 is not a fruit of the Spirit received from God, it is the faith through which God saves us at the moment we realize in our heart of hearts that what God says about us needing salvation through Christ is true and our notions of salvation by any other means are false. The third and final problem with claiming that the gift of God is faith is that in the Greek language, like other languages, words can have masculine, feminine, or neuter genders. The word faith is feminine in gender. The subject of the first phrase is also referred to by the next phrase, “and that not of yourselves” (Ephesians 2:8). In this next phrase, “that” is referring to what is being described. Since we have determined that the subject is salvation, the word “that” cannot be talking about faith. Likewise, the gender of the word “that” is neuter, not feminine, so it cannot be talking about faith, which has a feminine gender. Additionally, the gender of the word “it” is also neuter so neither “that” or “it” can refer to faith. Finally, we come to the end of Ephesians 2:8-9. This puts to rest any idea that Ephesians 2:8-9 is talking about anything other than salvation. We see over and over again that salvation is not of works. Therefore, if it is not of works, then no one can boast about how they saved themselves. This is made clear in Romans 4:1-5 where we are told that Abraham was declared righteous through his faith in what God said, not his works. It was the moment that Abraham realized in his heart of hearts that what God was saying was true that his faith became the instrument through, which God would save him. Some would say that faith is a work and quote John 6:26-41, but this is not talking about salvation, it is talking about doing works. This refers back to faith being the evidence of things not seen and the fruit of the Spirit. Practically speaking, it is this evidence that then motivates us to do good works for God. This is why Jesus referred to them seeking Him not because of the miracles He did, but because they wanted food. The people wanted to see a sign, or the evidence, before they believed. This is contrary to the teaching of Scripture that it is after salvation that we get to see the evidence of things not seen and have the ability to see and understand things that unbelievers cannot see (1 Corinthians 2:6-16). We conclude then that our salvation is a gift of God that no man can earn. The verses, Ephesian 2:8-9, are a simple, but profound statement about the gift of God that He has given to humanity. By carefully examining the context and phrases that make up these two verses, we can understand the theological and practical applications to God’s plan for humanity. Previous post: How Should Christians Deal With Depression? Next post: Did Christians Participate In The Salem Witch Trials?